KMA now provides a full scope of traditional architectural design services under the direction of Principal Josh Safdie, AIA, NCARB. Mr. Safdie is a licensed architect in the state of Massachusetts and his NCARB certification allows for registration in other states on an as-needed basis. 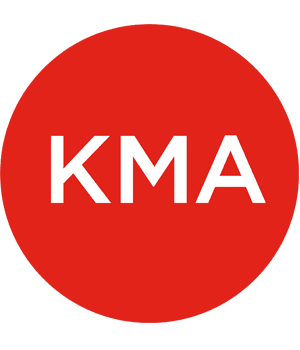 KMA offers a complete scope of services, including programming, zoning approvals, design and construction documents, bidding & permitting, and construction supervision. Our design team leverages the firm’s years of experience in accessibility and Universal Design consulting for residential, commercial, and institutional clients to provide architectural solutions to a myriad of project types. Our team works closely with trusted civil, structural, and M/E/P engineers, as well as landscape architects and other designers. KMA’s architectural design team includes LEED-accredited professionals and in-house interior design services. Light Hall, Northeastern University, Boston, MA. KMA is developing a concept design and feasibility study for single-room-occupancy residences to be leased by the Massachusetts Affordable Housing Alliance (MAHA). Originally built as apartments, this 19th century building was built before there were any accessible design requirements. Now it is owned by Northeastern University and currently used as a dormitory. KMA will assist Northeastern in defining cost and feasibility of the necessary access and safety upgrades to enable it to lease two floors to for MAHA’s SROs. KMA is modifying the master bath for a couple who want to continue living in their single-story 1950’s ranch house overlooking a golf course. They already have aides helping the spouse whose increasing dementia and a growing loss of dexterity and mobility require more care. Anticipating more functional changes and the need for additional space for an assistant, the couple moved to their summer home, while modifications were made. To minimize confusion on their return, KMA designed adaptability features without substantially changing the master bath’s layout or “look-and-feel.” Keeping the toilet, sink, and bath in the same general locations, KMA specified blocking behind all of the walls so that grab bars can be added, space for a transfer tub seat, and additional heat sources. They kept two vanities, but made new ones removable so that one can easily be removed to make more space for an aide to assist with bathing and dressing. Working with the Corian manufacturer, KMA designed hand holds built into the counters surrounding the sinks. The mirror remains in its same location, but lighting is enhanced with hard-wired motion sensor foot lamps, and finishes are in contrasting colors to help distinguish horizontal and vertical planes. The cork floor was replaced with a floor of the same color, but it easily washable and non-slip. KMA designed built-in storage so that equipment and supplies are readily available for the home health aides. Ecologic is an international not-for-profit development fund supporting sustainable agriculture patterns throughout Latin America. Because Ecologic’s employees often travel to-and-from Latin America, they wanted their new workspace to be flexible and offer multiple ad hoc spaces for collaboration. Because the new space has limited natural light, the design needed to capitalized on the available light and views afforded in the space. 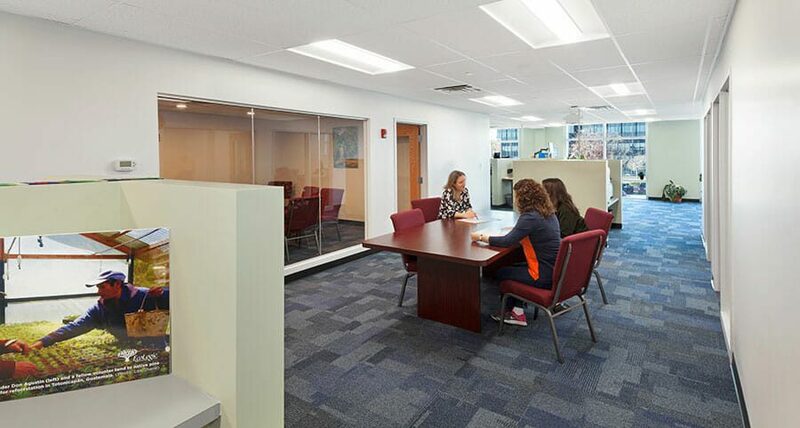 In addition to flexibility, Ecologic wanted the space to be intuitive, with plenty of maneuvering space and workstations that allow for a variety of workstyle preferences. This translated into half-height walls with integrated storage and adjustable-height work locations for sitting and standing users.